Long, tapering organic red romano peppers. Although they look like a giant chilli, they taste more like sweet, full-flavoured bell peppers. Local isn’t always best! 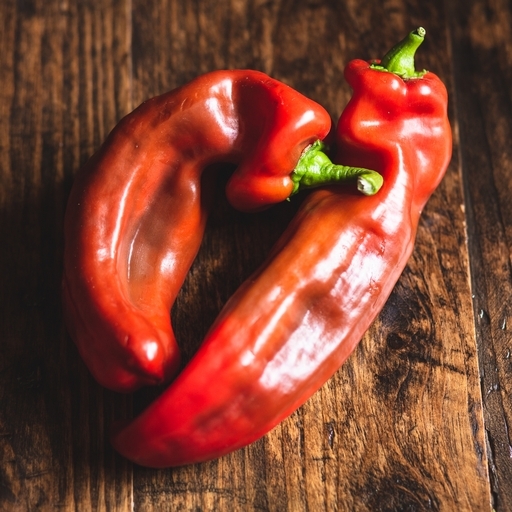 Peppers’ homegrown season falls in late summer, though they’re a customer favourite year-round. When our own pepper season is over, we truck over naturally sun-ripened ones from our friend Paco in Spain. This uses just a fraction of the carbon compared with growing them in the UK using heat. Eat raw in salads or with dips. Use in soups, stews or omelettes. Lots of recipes call for them to be roasted, giving a lusciously smoky, concentrated flavour: cook either in the oven at 200°C/Gas 6 or over the gas hob until the skin is black and blistered. Put in a bowl, cover with clingfilm and leave for 10 mins – this makes the skin easier to peel off. Delivered from our farm, so wash before cooking. Store in the fridge. We import our peppers from Spain and Italy as growing them in heated greenhouses is environmental madness..
Our peppers are sold as class 2. This means that they might not look cosmetically perfect, but they are grown for the very best flavour. (We have to tell you this to satisfy some EU rules).